"Wistful Wisteria gently blowing in the breeze of New Mexico. The gnarled and twisted stem belies the softness and elegance of the flowers but I love the contradiction: something beautiful stemming out of the dry, twisted old trunk. 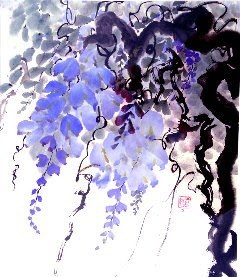 To the Chinese, Wisteria symbolizes prosperity and good luck in one's job and career. The media used: Chinese ink and Chinese water colors on Xuan paper. The red square on the right is a seal with my Chinese name and signature." Nora will be demonstrating her brush painting technique at the next Rio Rancho Art Association membership meeting on Monday, May 4th at the Destiny Center in Rio Rancho. The meeting will start at 6:30 p.m. You need not be a member to attend. hey paula, just have been going over the site and see you just posted Nora's info...i can't wait for the demo at the meeting. i am going to sneak away and see her during the tour. thanks also for the info on the New Mexico Mag's site. i went to it and looked at all the photos. and watched the judges video. Beautiful painting, Nora! can't wait to see you demo your wonderful Chinese Brush painting at the next RRAA meeting!